I found The Facefaker’s Game in Chandler Birch’s Reddit AMA thread. Chandler Birch seemed like a cool guy who at a very young age (24!) wrote a book that was likened to the work of Rothfuss and Lynch. 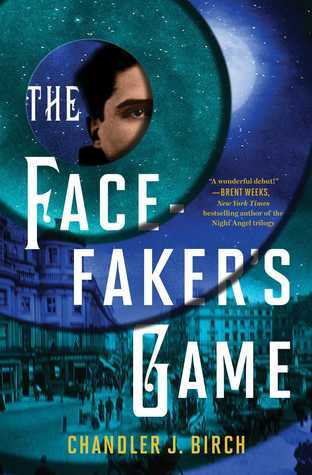 Although the bar was set pretty high, The Facefaker’s Game seemed interesting to me so I grabbed a hard copy on Amazon, and shortly thereafter The Facefaker’s Game was added to my long reading list. Now, nearly two years later *cough cough* I’ve finally read The Facefaker’s Game. I can’t believe it took me so long to read this delightful book. The Facefaker’s Game is a story told from the perspective of Ashes, an orphan pickpocket living on the streets of Burroughside, a small district of the enormous city Teranis. Ashes is rasa, one of the boys and girls that seemingly come from nowhere to the streets of Burroughside with no memory of their past lives. To survive, Ashes uses his card-sharping skills to cheat the Denizens of Teranis of their money. Ashes isn’t selfish though. He steals to provide for his gargoyle-faced rasa friend Blimey, who can’t be seen on the streets for fear of being murdered at the hands of Burroughside’s despotic gang-leader, Mr. Ragged. One day on the streets, Ashes tries to con a mysterious man who takes interest in Ashes’s peculiar skills. The man, known as Candlestick Jack, offers Ashes a position in his cadre of Weavers and Stitchers, illusionists that can bend light and perception to their will. Though I don’t think this book quite lives up to comparisons to the famous authors in its summary, but those comparisons do have several footholds here and there. The Facefaker’s Game reads like a much more interesting version of Oliver Twist. Birch’s prose is wonderful to read if you prefer stained-glass window prose (here is where they draw the Rothfuss comparison) to windowpane prose (more like Sanderson). Heists, deception, and an engaging magic system are all interwoven in this book that will provide a satisfying ending while leaving you wanting to read more. The Facefaker’s Game is available at Simon & Schuster and Amazon.